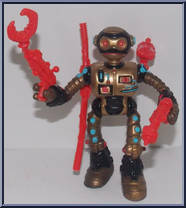 The Sleek Servo Servant! 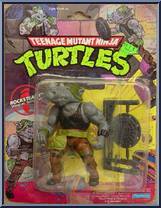 VITAL FUGITISTICS: Accessories: Electro-Stun Stick, Metal-melting Machine Gun, Grappling Claw, Skeletal Scanner Birthplace: Peblak, on the Planet D'Hoonib Weight: 200 lbs. . . 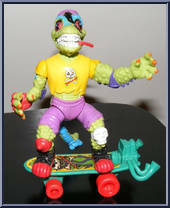 The Rip Roarin', Skateboardin' Reptile! 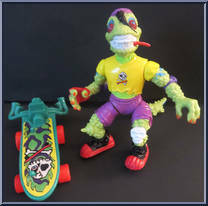 VITAL GECKTISTICS: Accessories: Turbo-charged Sewer Skateboard, Tail Skate and Label Sheet Birthplace: Quarterpipe, Hawaii Height: 4 ft. (over the lip) We. . . 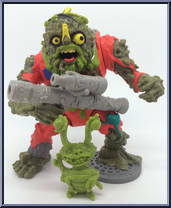 The Garbage-gathering Ghoul and His Parasitic Pal! 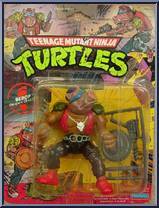 VITAL MUCKTISTICS: Accessories: Removable Skullcap, Muck Gun and Muck Pack Birthplace: Sewer City, U.S.A. Height: Smells too bad to measure Wei. . . 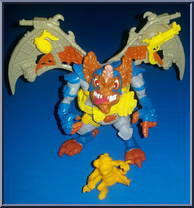 The Non-stop Mutating Monster! 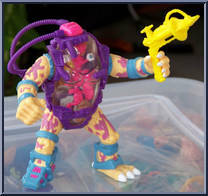 VITAL GUTISTICS: Accessories: Mutagen Machine Gun, Gooey Garbage, Life Support System, Skull Plug Birthplace: Krang's lab Weight: 500 lbs. (not including guts) Fav. . . 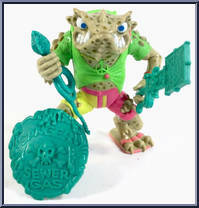 The Swamp Surfin' Sewer Toad! 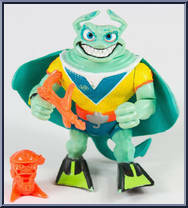 VITAL TOADTISTICS: Accessories: Foot-swatter, Serpent Slasher, Sewer Gas Shield, Mutant Fly Friend Birthplace: Surf Swamp of Okeefenokee, Florida Weight: 175 lbs. (after. . . 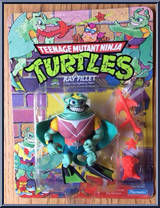 The Swamp Surfin' Sewer Toad! 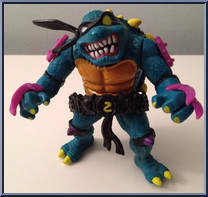 VITAL TOADTISTICS: Accessories: Foot-swatter, Serpent Slasher, Sewer Gas Shield, Mutant Fly Friend Birthplace: Surf Swamp of Okeefenokee, Florida Weight: 175 lbs. (a. . . 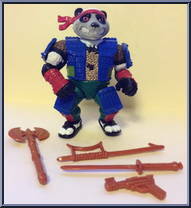 The Samurai Bashin' Bear! VITAL PANTISTICS: Accessories: Dragon's Claws Sword, Battle Axe, Fusion Blaster, Gou Hook Birthplace: A small out of the way dimension Height: 8' Weight: 350 lbs. (that. . . 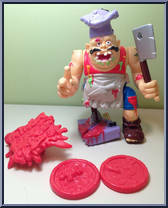 The Psychotic Pizza Chef! 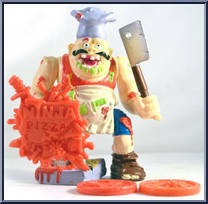 VITAL PIZZATISTICS Accessories: Pizza Peg Leg, Clever Cleaver, Pizza Box Shield, Two Propelling Pizzas Birthplace: Pisa, Italy Blood Type: Extra Spicy Weight: Deep Pan . . . 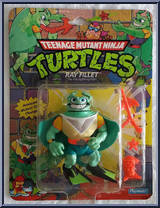 The Fist-fighting Fish! 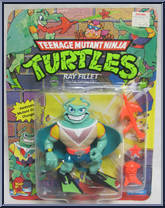 VITAL FISHTISTICS Accessories: Ray Gill Gun, Fish Stix, Scarfish Birthplace: 1999.5 leagues below the sea Water Displacement: 500 lbs. Favorite Movie: The Deep Favortie . . . 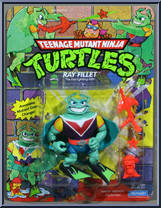 The Turtlebustin' Exterminator! 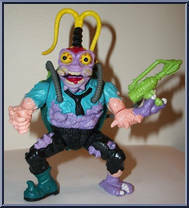 VITAL BUGTISTICS: Accessories: Bug Pack with Hose Assembly, Turtle Exterminating Gun Birthplace: Under Shredder's Foot Height: 5' 5" (with fully extended ante. . . 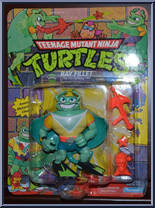 The Evil Turtle From Dimension X! 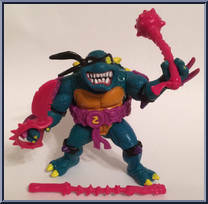 VITAL SLASHTISTICS: Accessories: Nasty Nunchuku, Psyco Sai, Mutant Mace, Twisted Turtle Belt, Razor-spiked Gnarly Knife Birthplace: Universe Number 9, Dimension X. . . The Hard-headed Horned Hoodlum! 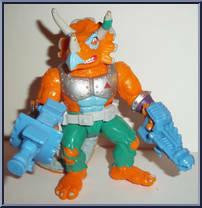 Accessories: Neutron Neutralizer, Laser Phaser, Unearthly Utility Belt Birthplace: Homeworlds of Dimension X Height: 2' 6" (in Dimension X) 8' 9" (here on . 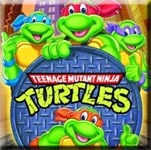 . .
Dingbat Buddies who Bite the Baddies! VITAL BATISTICS: Accessories: Bat Gun, Plasma-propelled Bat Wings, Blood-burstin' Bat Bomb and Utility Bat Belt Birthplace: Belfry, Transylvania Height: 5' 5. . .